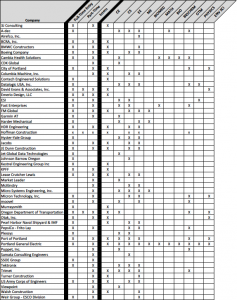 A list of some of the companies attending this year’s career fair can be seen below. Click here to view the companies and their current opportunities in Handshake! More information about the Career Fair will be posted here as we get closer to the date of the event. Employers, please contact swecareerfair@up.edu to receive information about registering for the career fair. 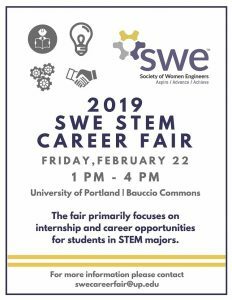 The Society of Women Engineers (SWE) at the University of Portland, the Shiley School of Engineering, and the UP Career Center invite you to the 2019 SWE STEM Career Fair! This Career Fair gives companies the chance to connect with UP alumni and students, primarily those majoring in mechanical engineering, civil engineering, electrical engineering, computer science, and biomedical engineering (graduate) as well as biology, chemistry, biochemistry, pre-health professions, mathematics, physics, environmental science, and operations & technology management will be encouraged to attend. Another workshop will be offered during the first half of the February SWE meeting on Wednesday, February 13th in Shiley 319 at 5:45pm. The second half is mandatory training for any Career Fair volunteers. The University of Portland is a private Catholic university located in Portland, Oregon with a student body of 3,757 undergraduates and 478 graduate students. Science, engineering, and other technical majors receive an education rooted in rigorous scientific and technical courses. As a result, students are well-rounded, analytical problem solvers with excellent communication and reasoning skills. To provide the best possible education to its students, thus enabling the students to become competent practicing engineers and computer scientists. The programs also provide a base for both graduate study and lifelong learning in support of evolving career objectives. These objectives include being informed, effective, and responsible participants in the engineering profession and society. The School endeavors to develop qualities that are essential for the practice of engineering and beneficial service to the community. These qualities include knowledge of engineering principles, the ability to apply those principles to solve problems, and the development of professional, personal, and social values. The School of Engineering offers Bachelor of Science degrees in civil engineering (B.S.C.E. ), electrical engineering (B.S.E.E. ), and mechanical engineering (B.S.M.E.). These programs are accredited by the Engineering Accreditation Commission of ABET, http://www.abet.org. The School of Engineering offers a Bachelor of Science degree in computer science (B.S.C.S.). This program is accredited by the Computing Accreditation Commission of ABET, http://www.abet.org. Parking on the day of the event is free. Please see the map for parking lots which are located right next to the Chiles Center and down by the river at Franz (River) Campus Parking. A shuttle service will be available for the Franz (River) Campus Parking.